Not bad for one of the supposed villains of the post-Sullivan years. I suspect Raymond Hood would have been good company at the pub. Chicago’s 1923 zoning ordinance was passed in the wake of controversy surrounding the Chicago Temple, a venture of a downtown Methodist Church that received a variance from height restrictions for its 556-foot spire. The previous code had set a limit of 260 feet for occupied floors, with loopholes for towers or spires up to 400. The 1923 ordinance, however, specified setback requirements above the maximum for the basic building block. Past 264 feet (a slight uptick reflecting typical floor to floor heights of the time), the new ordinance only required that towers be set back at a 1:10 slope from surrounding streets lot lines. It made no mention of whether these towers could be occupied, or rented, and it placed no absolute limit on their height. The “lid,” according to one writer, had been quietly “ripped off.” Towers on the street front had no setback requirements, provided they took up less than 50% of the lot’s linear frontage. Skyscrapers of the 1920s, therefore, start to look very different from those built under the old code. The first of these, the Straus Building by Graham, Anderson, Probst, and White, was the first to test the City’s appetite for taller spires. Though its central tower only rose 475 feet (under the setback limit, it could have gone as high as 560), it was the first to offer rental space above 264 feet since the mid-1890s. The tower floor plates were small, hard to access, and crowded with elevators, stairs, and toilet rooms, but their views over Grant Park and the Lake were spectacular. Straus was a real estate finance company that took pride in its record of conservative investment, and this building, which served as their headquarters and a speculative investment, was no exception. Midway through the design process they hired a consortium of building owners and managers to audit GAPW’s plans, looking for further cost savings and plan efficiencies. Among other things, the group suggested using the dead space between express elevators for additional offices, a trend that has continued in buildings with similar elevator services. Today’s architects will recognize this process as a forerunner to the dreaded “value engineering” that, in the words of one of my former colleagues, is often “two lies in one.” Straus meticulously scheduled the project, hiring contractors and construction consultants to work with GAPW throughout the design process–again, foreshadowing today’s ‘fast track’ construction. Straus did not skimp on finishes, however, making a calculated effort to provide the “atmosphere” that would attract first class tenants. The leased banking hall on the second floor had its own entrance from Michigan and was elaborately styles with Roman Corinthian columns–appropriate, one critic noted, since the Romans likewise used their management skills to achieve grand buildings. On top, in a rather un-Straus like flourish, GAPW designed an electric beacon, a ‘beehive’ that capped the setback tower and firmly announced the project on the Michigan avenue skyline. People's Gas Buildng, D. H. Burnham & Co., 1911. Michigan & Adams. 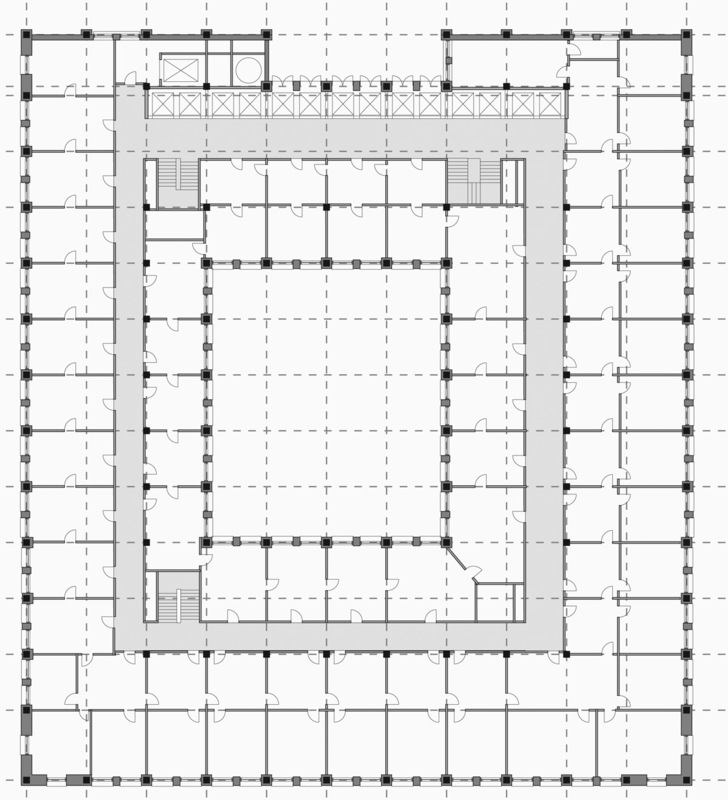 In addition to looking at building structures and enclosures, the project I’m working on also looks at building planning, in particular the extents to which architects and clients went to ensure access to outside light and air. John Wellborn Root’s essay, “A Great Architectural Problem,” written in 1890, said that skyscraper design was, at its most basic, the provision of adequate daylight to as many areas of the building volume as possible. Any areas without daylight, experience proved, would be otherwise unlettable. Several basic plan types emerged from this. Long, narrow lots produced slabs of offices, usually organized around a single double-loaded corridor. The Monadnock is a good example of this. Corner lots often produced L-shaped plans with the internal corner left open, sometimes with a skylit lobby or small banking hall below. If the lot was large enough, though, architects tended toward a donut-shaped plan, wrapping two layers of offices and a double-loaded corridor around a hole in the middle that allowed interior offices access to light and air. The walls of these courts were typically clad in enameled brick, which reflected light and helped illuminate offices on lower floors. Burnham and Root used this type of plan most extensively, beginning with the Rookery in 1888 and continuing through the electrification period of 1908-1912. People’s Gas, shown here, is a good example of the type. Light courts remained, however, even after electricity became a viable, economical alternative to daylight after 1912. In addition to illumination, light courts provided cross-ventilation. Office doors typically included transom panels at their tops that could be opened, permitting air to flow through relatively narrow floor plates. While mechanical ventilation was used in theaters and stores by the turn of the century, air conditioning did not arrive in Chicago until the early 1930s. 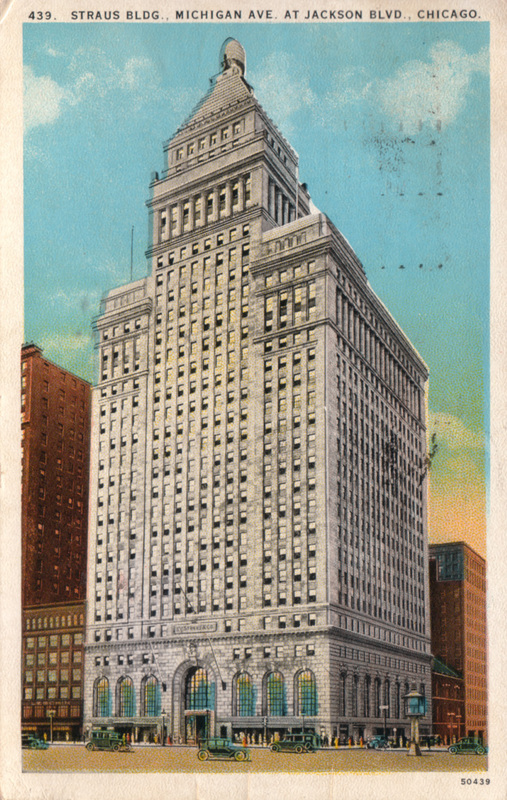 Light courts, with their heavy penalties in loss of rental area, disappeared quickly and buildings like the Merchandise Mart ushered in an era of vast, electrically illuminated and mechanically ventilated floor plates. Officially announced today as Burj Dubai’s height. And, just like Sears, it’s had a name change, to Burj Khalifa. 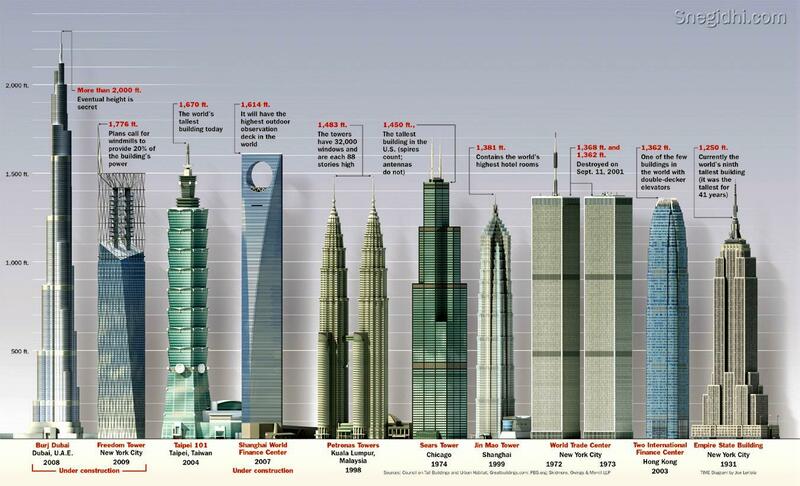 As of tomorrow, there’s a new tallest building on the planet. When Petronas Towers, and later Taipei 101, opened, there was a good bit of arguing over what constituted the “tallest building in the world,” since both of those were, arguably, shorter than the Sears Tower in Chicago–by a fair margin. Once Burj is open, there won’t be any arguing. Its exact height remains a closely guarded secret, but it’s at least 800 meters tall (2625 feet compared with Sears’ 1454), or just about half a mile. The headlines, of course, are whether anyone is left in Dubai to move in, and the economics of the tower raise important questions about resources, functionality, and whether buildings this tall are really just exercises in ego. The short answer is that no, no tower really needs to go that high, the economics of mega-projects like this have proven toxic in almost every case, and the functionality of elevators in particular means that towers this tall don’t work in ways we’ve come to expect. While apartments near the top sold for almost $1900 a square foot in the midst of Dubai’s boom, buyers today are being courted with prices half that amount, and whether anyone has the cash or the desire to stay in the ‘seven-star’ Armani hotel is a question that seems likely to answer itself. But, the client in this case was the one who, for whatever reason, pushed SOM to explore the limit of what was possible, and there’s no question that the engineering feat here is pretty remarkable. Burj Dubai has redefined what happens at super-tall heights, as the design team discovered that their primary structural mission, after making the thing stand up, would be shedding turbulent wind vortices that might otherwise have set up disastrous vibrations. So, while the publicity will talk about the ‘floral’ shape of the tower’s plan, the engineers will sit back and chuckle, knowing that the lobes, asymmetries, and cladding fins are all about making sure the thing doesn’t shake itself to pieces. As for Sears? It can comfort itself knowing that it’s still the world’s tallest commercial office tower. And it seems likely to hold that title, as the shapes of the new generation of supertalls almost require small-floorplate apartments near the top to be lettable. You are currently viewing the archives for January, 2010 at architecturefarm.